The company is investing nearly £8 million in the business including an expansion of its production and office facilities and the construction of a new 37,500 ft2 factory. The investment also includes the creation of 80 new roles and a leadership and skills development programme. The investment will support the company’s growth plans as it wins new business in export markets, such as a recent order worth £750,000 in Oman. Alastair Hamilton, Invest Northern Ireland Chief Executive said: “EDGE Innovate is a global exporter on a significant growth trajectory. We have worked closely with the company for a number of years now, most recently with our Scaling Team and it is a pleasure to visit today to see the results of the company’s commitment. “EDGE has been focused on growing exports and has worked with our teams in a number of markets. Most recently the company secured a significant export deal with one of the largest engineering groups in Oman. Recruitment of 80 additional staff is well underway with almost half of the roles already in place. The remainder are to be recruited by 2020. 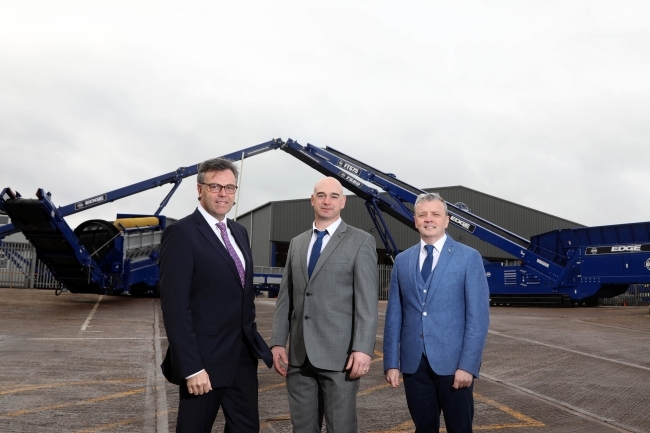 Invest NI has offered the materials handling equipment manufacturer over £957,000 towards its investments aimed at driving continued export growth. Darragh Cullen, Managing Director, EDGE Innovate added: “The success EDGE Innovate has enjoyed in recent years is ultimately a reflection of our people. As part of our growth plans we are investing in our staff with a major leadership and skills development programme across all business areas, including the introduction of a new welding academy. We are also growing our team with 80 new staff and are already half way towards this recruitment target. “At the same time, demand for our products is increasing. This investment ensures we are able to capitalise on this demand with the additional space, equipment and people needed to achieve our export targets. Invest NI’s support is helping us make this investment at a quicker rate, meaning we are able to capitalise on new export opportunities. EDGE Innovate designs and manufactures a range of quarrying, mining, materials handling and recycling equipment. The capital investment will provide additional cutting and welding facilities as well as housing a research and development unit and a new quality control centre.